Top Practices is the premier marketing company for podiatrists across North America and Australia. Since 2007, we have helped hundreds of podiatrists grow their practices by getting their marketing on track. With a plan that works and a team that specializes in marketing medical practices, we help offices of all sizes move from struggling to thriving. Top Practices was founded in January of 2007 by Rem Jackson and Diane Jackson. Rem spent many years working in educational publishing for Harcourt School Publishers and Reed-Elsevier, with extensive experience in sales, marketing, and management in health care fields. After a more than 20-year career he recognized the need for more effective marketing in the podiatry field. Rem saw doctors being drastically underserved in their marketing—both understanding what to do and having the resources and tools to execute it. His unique experiences combined with working closely with the American Academy of Podiatric Practice Management (AAPPM) professional development programs helped him create what became the Top Practices approach to marketing. Now the company enables podiatrists and other professionals on a global scale to build their practices using our innovative and out-of-the-box marketing programs. 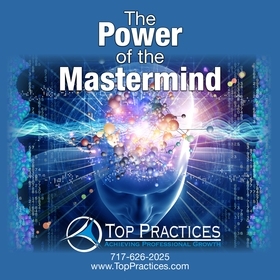 The core of the Top Practices approach is the Mastermind group. This is a group of dedicated, driven professionals in the same field all sharing what they know so that all the members grow and succeed. The members collaborate and learn from each other, bringing their challenges, questions, ideas, and best strategies to the table for brainstorming. This allows physicians to learn from the very best in their fields: other doctors who are on the “front lines” of professional practice and seeing the growth they want. When doctors join Top Practices, they have access to Rem and the Top Practices experts each month in regularly scheduled “open office hours” that they can call into and get help from coaches. They also participate in a series of Mastermind calls with Rem and industry experts to learn the newest and best developments in marketing a podiatry practice. Physicians are also introduced to Rem’s Four Pillars of Marketing. This innovative approach to marketing a podiatry practice that Rem Jackson developed in 2008 throws most traditional marketing on its head for a far better strategy. Instead of tossing your information to the media winds and hoping potential patients find you, it applies an interconnected strategy to speak directly to the patients you want to see. The four pillars are: web-based, referral, internal and external marketing. By coordinating all four areas and targeting them correctly, you are able to craft a marketing approach that pays for itself many many times over. Hundreds of podiatrists have used this strategy since its inception and seen significant growth in their practices. Top Practices also has a wide variety of products and services designed specifically using our unique and out-of-the-box approach to marketing to help you achieve your goals. Virtual Marketing Director Services: Directed by Lori Hibma, the VMD Services team is here to help you succeed in your web marketing. Whether you need help with social media, website management, video editing, graphics, or anything else about your practice on the internet, our experts can help you. Practice Management Institute: Ever feel like your office is disorganized or not operating efficiently? 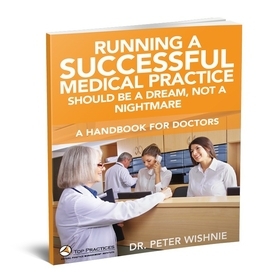 Practice management experts Dr. Peter Wishnie and Tina DelBuono work with Top Practices to provide the practice management expertise and information that addresses your individual practice’s needs and teaches you strategies to improve them. Newsletter Program: Every practice should have a newsletter. This is one of the most valuable—and under-used—tools available to doctors. That is why we offer a customized monthly newsletter for you to send to patients. 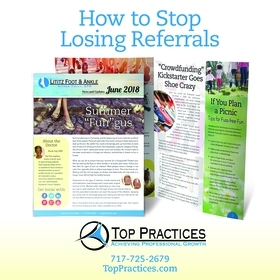 If you don’t have a newsletter already, contact us to ask about the Top Practices program. You can email us at [email protected] or call (717) 626-2025 x 1. Book Campaigns: Books are an essential tool for doctors to grow their practices. This crucial aspect of the informational marketing approach has one of the greatest return on investments (ROI) in medical marketing. Contact us for more information. Additional Products: Top Practices Members have access to a private online library filled with the resources and information Rem Jackson and the Top Practices team have developed and refined over the years. Members are also able to purchase additional resources, including the copywriter’s workshop. Top Practices is here for any physician who doesn’t want to settle for just surviving in his or her practice. If you’re looking to grow, contact us for more information about joining the Mastermind Group. You can check out our application, e-mail us at [email protected], or call(717) 626-2025 x 1.